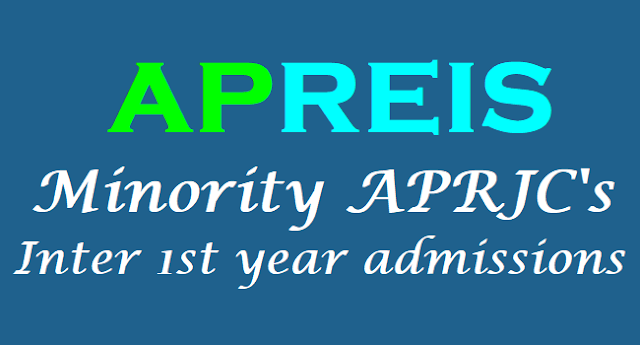 AP Minority Junior Colleges Admissions 2018 (APreis Minority APRJCs Inter 1st year admissions)/ APreis Minority APRJCs Inter 1st year admissions 2018, Apply before May 25 at aprs.cgg.gov.in/ APREIS Minority Residential Colleges Inter 1st year admissions 2018 notification, Apply before May 15: Last date to apply for Minority AP Residential Junior Colleges Inter 1st year admissions, AP Minorities Residential Junior Colleges Inter 1st Admissions Online application form, Minority APRJCs Inter 1st year admissions, APREIS Minority Junior Colleges Admissions, AP Minorities Gurukulam Junior Inter Admissions 2018, APMR Junior Colleges Admissions, Eligibility criteria, Selection list(Results) Announcement date, Counselling date and other details given here. APREIS Notification for admissions in junior intermediate of Minority AP Residential Junior Colleges for the academic year 2018-18. Presently, APREI Society is managing 03 AP Residential Junior Colleges for Minorities. 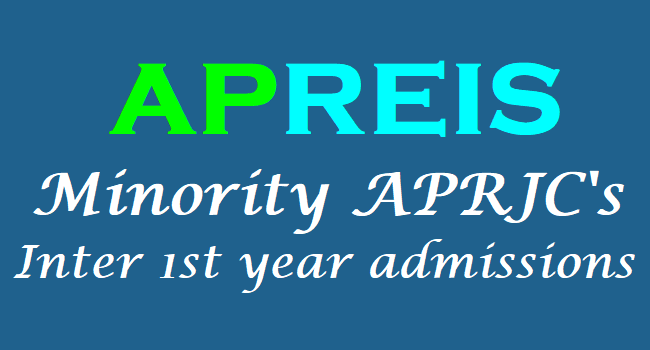 APREIS has given the Minority Residential Colleges Inter 1st year admissions 2018 notification and online applications are invited from the eligible candidates for admission in junior intermediate of Minority AP Residential Junior Colleges for the academic year 2018-19. • All the APR Junior Colleges are providing education in Residential Mode. • Individual attention is being paid to each student. • Loco Parent system is implemented by appointing one loco parent to a group of 15 to 20 students. • Day starts with the physical exercises and Classes will commence at 8.00am and academic activities will continue till 10.00pm in the night. • Apart from the academic activities, importance is given to sports and games and other co-curricular activities for all-round development of students. Facilities and fee payable to the college at the time of Admission at all APR Junior Colleges: The colleges offer free education besides free boarding and lodging to all selected candidates. Special care is taken for talented and low achievers. Loco parent system is adopted to look after and guide the student staying in the hostel. admission for 1st year and Rs 1000/- in the 2nd year. b) Must h a v e passed the qualifying examination in first attempt in March/April 2018 only. Candidates who have passed in earlier are not eligible need and not to apply. c) Candidate must secure a minimum GPA of 5 in S.S.C or equivalent qualifying examination and GPA of 4 in English for all the candidates. Selection of students shall be made based on the Merit in SSC March-2018. The SC and ST seats will be filled in 03 above Minority Junior Colleges through APRJC CET-2018 only. i. The candidate shall first go through the information bulletin carefully and satisfy their eligibility for submission applications for admission. ii. The candidate after satisfying himself/herself about the eligibility criteria for the submission of application through online shall pay a fee of Rs.30.00 from 06-05-2018 (after 4.00pm) to 25.05.2018 for submission of application through Online. iii. At the Internet Centre, the candidate has to give the required preliminary data. (i.e. Name of the candidate, Date of birth and mobile phone number). On receipt of fee at the Internet Centre, the candidate shall be issued a Journal Number with which she/he can proceed with submission of application through online through the website http://aprs.cgg.gov.in. Issue of Journal Number does not mean that the candidate has completed submission of application online. It is only a confirmation of the fee received. v. Before submission of the Online application form, the candidate has to fill up the Model Application form (given at annexure-2). vi. The candidates shall follow the procedure for submission of online application as given in the ‘Information Bulletin’ and also as per the instructions provided online while filling up the online application form. The Candidate should be ready with photograph of size 3.5 X 4.5 cms before filling the on-line application. The Photo should be scanned and uploaded along with the application form. viii. The candidate has to mention the name of colleges in which admission is seeking. (See the annexure-1 for jurisdiction for admissions). ix. On submission of Application through ONLINE, the candidate has to take a copy (print) of application form in which a reference number also be given. x. For any mistake/incorrect information, the candidate is solely held responsible. Hence, they must take utmost care while filling the online application. xi. The Applications of the ineligible candidates will be rejected summarily. xii. The selected Candidate should be able to produce the original certificates at the time of admission as a proof to the information furnished in the application. xiii. The selection of the candidate will be summarily rejected if they fail to submit the necessary documents at the time of admission. 2. The Principal reserves the right to cancel the admission at any stage, if the particulars furnished by the candidate are found incorrect or against the rules of admissions. i. The higher GPA secured by the candidate in Mathematics for MPC/EET, Biological Science for BPC/CGDT and Social Studies for MEC/CEC will be considered. ii. If still the tie persists, the higher GPA secured by the candidate in Physical Science for MPC/EET and for BPC/CGDT, Mathematics for MEC/CEC will be considered. The Journal Numbers of the selected candidates shall be made available on the websites: http://apresidential.cgg.gov.in/indexedu3.aspx or http://aprs.cgg.gov.in. Date of First selection list for admission will be on: 01.06.2018.